What does it take to put together a successful email campaign? It all sounds pretty simple when you think of it. Segment your list, create the email, send it out, evaluate results, repeat. Right? Well, not so fast. I’ve now spoken to small business owners and startup founders and they have the same initial feeling that it should just work. But, when it comes time to actually execute, something is missing. Although “email marketing” is the name of the game, there are actually many pieces you have to put into play and organize in order to make the most of it. There are landing pages, thank you pages, linking all to a CRM system and ensuring you are capturing leads and nurturing them. So in order to help those thinking about how to start their own email marketing programs, and also for those interested in looking at the whole process in more detail to see what else can be done to improve results, let’s take a moment to deconstruct a typical email marketing campaign. The following is like the anatomy of an email marketing process with the pieces each dissected and analyzed. In general, most email marketing campaigns will look something like the image shown below. You have an Email that is created, which will have a link to a specific Landing page, which in turn will link (not always, but usually if you have a form) to a Thank You page, which typically triggers a final Thank You email. Dynamic content based on job title, role, industry, etc. All of these combined will influence well your email will perform. The landing page is the web page that holds the offer you talked about in your email. It doesn’t need to be an “offer” like in sales promotion, it could simply be a piece of content that you download or watch online. Having people click on an enticing offer in an email is only half the battle. Will they actually go through with their intent and do what you want them to do, whether it is downloading the whitepaper, watching the video, or filling out a form? 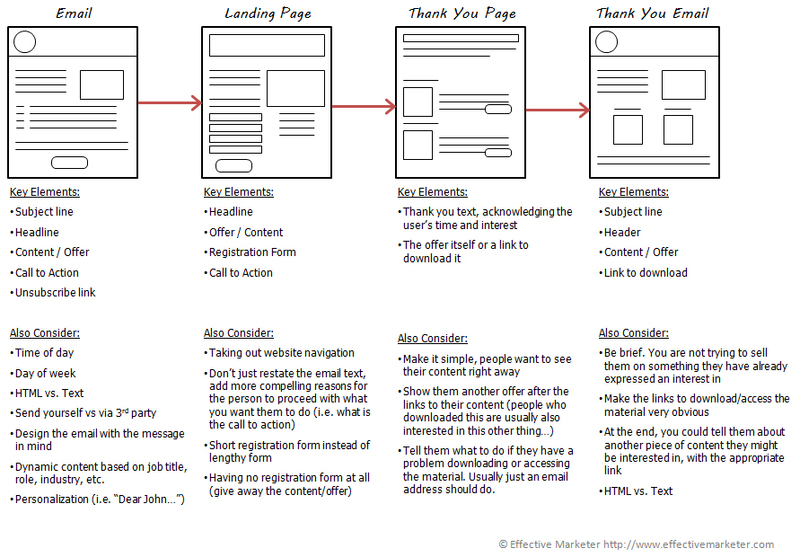 The design and content of your landing page is critical. Tell them what to do if they have a problem downloading or accessing the material. Usually just an email address should do. Not doing this one is a missed opportunity. After someone registers for your content, make sure they are able to download the offer by emailing them a quick “thank you” email containing a link to the material they were promised. The follow up email is a good opportunity to re-think the message and craft a different email that might entice those who didn’t take any action after the first one went out. 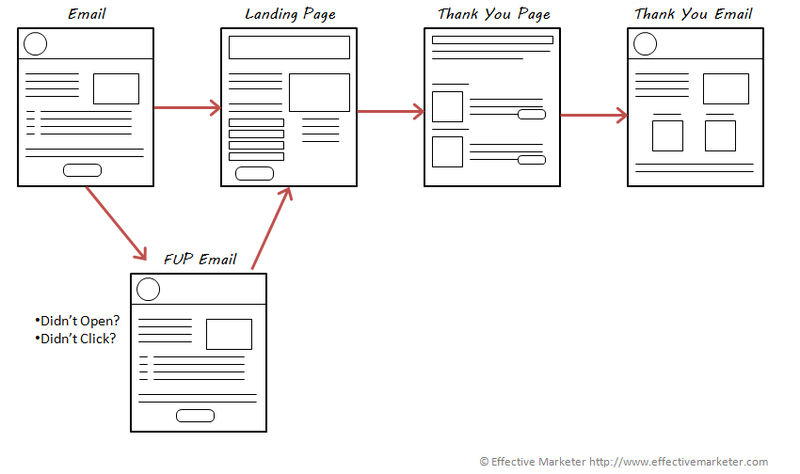 The image below shows the process taking into account the new email you may want to add to your email marketing process flow. As people click through your email, register on your landing page, and download your offer, you will want to make sure it is all being captured in a database somewhere. There isn’t a single email marketing software vendor out there that won’t have at least the simplest of analytics. From the moment you schedule your campaign to go out the email software is tracking everything. It will tell you who it was delivered to, who opened and didn’t open, which ones bounced, etc. The next step, the landing/registration page should also have a way to communicate back to you the registrations. The least you want done is to have a way to get that information back to your CRM system so that you can track which prospects or customers interacted with the campaign and registered or downloaded your offer. As you get to a point where Email Marketing becomes a key ingredient in your marketing toolbox you will want to start investing in a Marketing Automation solutions, because most of the MA solutions out there will give you some way to make this whole process a bit easier. The Marketing Automation software can not only track the email responses, but also the registrations from your landing page (if you used a form) and the downloads. In addition, the Marketing Automation software will help get people who responded to your email campaign into a lead nurturing process. In fact, many of your email marketing campaigns, once you have a Marketing Automation solution in place, will start looking very much like part of a bigger nurturing process themselves! 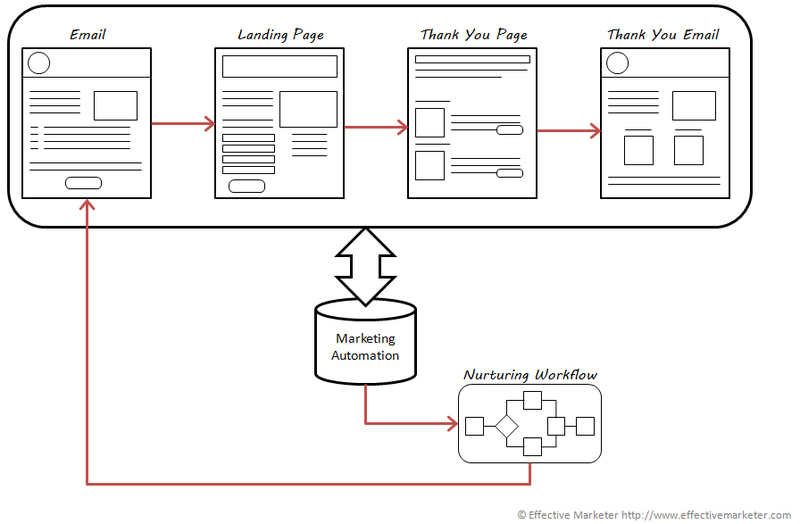 The image below shows the process flow with the Marketing Automation solution component. And how about scoring? As you start playing with Marketing Automation, that’s the next step in thinking through your email campaign process. How will you score different interactions between all components? What score will people receive for opening but not downloading your offer? What score will you attribute to different offers on your landing page? And what score will you attribute to different fields in your registration form (if you have one)? Don’t worry if this sounds like too much to digest. Start small and go slowly. Don’t have a Marketing Automation solution yet? No worries.. use your Email Marketing system and just make sure that you have a way to get the results back to your CRM or whatever contact database you are using. Then, as you get more comfortable and grow your list and the frequency of campaigns, you can start looking at Marketing Automation. The important thing is to use this anatomy of email marketing to think through all the steps and components and make sure that you are crafting compelling, consistent messages and that each step of the process is being optimized. I hope this brief exercise helped you get a better understanding of what goes on in creating an email marketing campaign. This entry was posted on Tuesday, April 10th, 2012 at 9:00 am and is filed under Content Marketing, Email Marketing, Marketing Automation. You can follow any responses to this entry through the RSS 2.0 feed. You can leave a response, or trackback from your own site.